Day two of AHRA 2017 is in full swing! The Exhibit Hall is booming with great conversations between attendees and our vendor supporters. 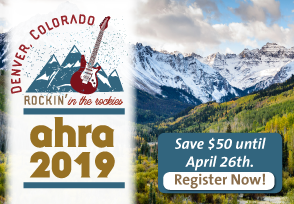 Make sure you go check out the products they’ve brought to show you, and thank them for their support of AHRA and the Annual Meeting! To backtrack a bit, there were two receptions held last night that provided fun and networking opportunities. First up was the New Member and First Time Attendee reception, sponsored by West Physics. The reception attendees were able to meet fellow new members, as well as introduce themselves to some long-time AHRA members who came by to welcome them. We hope to see you all at many more meetings to come! Finally, everyone gathered together at the President’s Reception, where President Jason Newmark called everyone to attention with a blast on his conch shell. Old friends were reunited and new friends were made as everyone enjoyed the food and beverages available. Sandy Edson was the lucky winner of our first EF Raffle prize, a pair of Bowers & Wilkins p7 Wireless Headphones, donated by Mednovus. There are still many great prizes being given away this week – you can purchase tickets at the EF booth in the Exhibit Hall or outside of the general sessions.